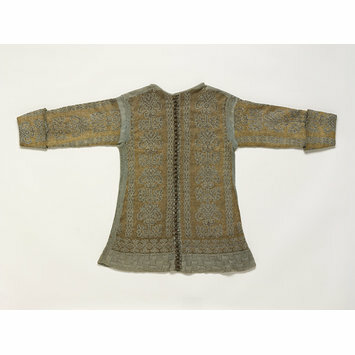 Knitted silk jackets were fashionable in the early 17th century as informal dress. This example is very finely knit by hand in plain silk yarn and silk partially wrapped in silver thread, in contrasting colours of blue and yellow. Characteristic of this style of jacket, it has a border of basket weave stitch and an abstract floral design worked in stocking and reverse stocking stitches. The pattern imitates the designs seen in woven silk textiles. The jacket is finely finished with the sleeves lined in silk and completed with knitted cuffs. Along each centre front, a narrow strip of linen covered in blue silk has been added, with button holes and passementerie buttons, worked in silver thread. The provenance of the jacket indicates that it is probably Italian. Long sleeved jacket hand knitted in blue silk yarn, blue silk partially wrapped in silver and yellow silk partially wrapped in silver. The back and two fronts have been knit flat and sewn together; the sleeves, lined in blue silk are knitted in the round with a shaped separate cuff. The jacket fastens down the front with passementerie buttons and button holes worked in silver thread on a strip of linen-lined silk sewn to each front edge. Knitting stitches include stocking, reverse stocking and basket weave. The jacket is worked in a repeating pattern of abstract floral motifs imitating woven silk designs. The centres of each flower are knitted in the blue/silver yarn in reverse stocking stitch. Length: 64.0 cm approx., Width: 102.0 cm overall, approx. 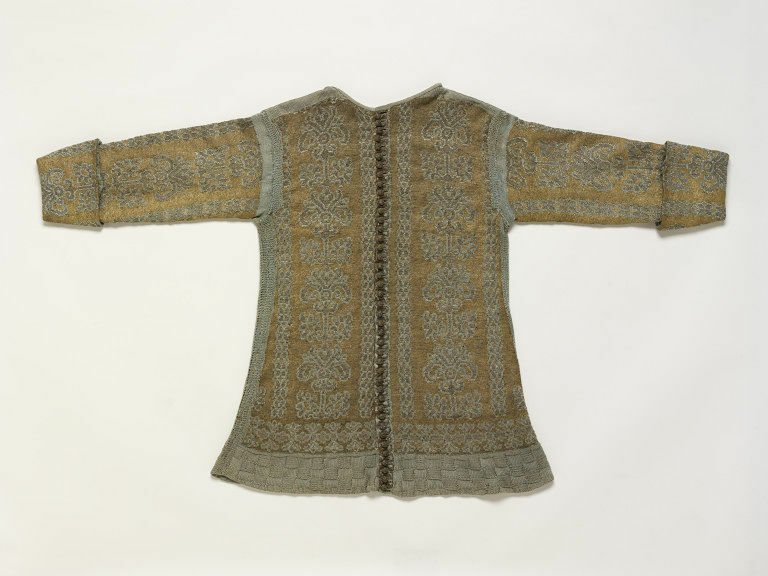 Historical significance: This is a particularly finely knit and well made example of an early 17th century knitted silk jacket.